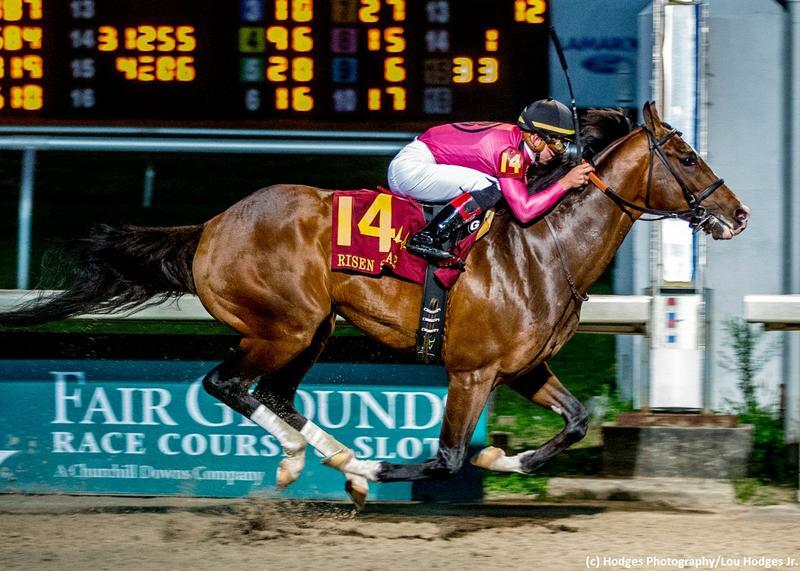 War of Will takes aim on a Fair Grounds triple when leading a talented field of 11 in Saturday’s $1 million Louisiana Derby (G2) . The Mark Casse trainee was victorious in the Lecomte Stakes (G3) and Risen Star Stakes (G2), and aims for a third successive score in the Road to the Kentucky Derby points event. War of Will is currently atop the leaderboard with 60 points. This colt rallied from last to finish a clear third in the Risen Star in a second start with blinkers on. The late runner gets a cozy rail post in this spot and will be making one run in the lane on this occasion. Improvement could see the Kentucky-bred make the frame late. This recent maiden winner made good in his first route attempt with a front-running tally on the Gulfstream Park turf. The Florida-bred colt makes a huge class rise to the graded ranks in a strong field. The speedy sort should factor for the early lead in his local and stakes bow. This sneaky contender made up some ground in the Risen Star late and figures to be fitter second time off the shelf in here. The gray colt has trained well in the interim and he receives a fine jockey upgrade to Jose Ortiz for this assignment. The former claimer was a closing second in both the Sham Stakes (G3) and Southwest Stakes (G3) in preparation of his first run at Fair Grounds. The dark bay colt is improving, but he will need another forward move to challenge for the top prize in this field. This $150,000 juvenile purchase graduated in style over a big field on this surface most recently. The consistent Kentucky-bred has a useful turn of foot and has trained in swift fashion in preparation of his stakes debut. He could be a top-four contender with another move in the right direction. The clear one to beat, this bay has never been defeated from three lifetime tries on dirt, which includes a pair of graded wins on this main oval. The classy colt draws in the middle of the pack and will be pressing the pace from the outset once again. He looks formidable in a field without a lot of early presence. This talented sophomore made a nice middle move in the Risen Star before tiring late in a race he needed off the layoff. The Kentucky-bred could be forwardly placed in this run at a big price. This colt made a fine stakes debut in the Risen Star when rallying from well back to be a sharp runner-up. The Bill Mott trainee has improved his BRIS Speed number in every start, and he almost surely will appreciate the additional ground in the Louisiana Derby. This Steve Asmussen pupil failed to impact both the Smarty Jones Stakes and Southwest Stakes (G3) in anticipation of this event. The Empire State-bred will need an immediate form reversal to challenge the top runners in the field. A wildcard in this cast, the chestnut toyed with allowance foes at Tampa Bay Downs in his seasonal debut, drawing clear by 11 lengths with ease. The Kentucky-bred sizzled a bullet five furlongs last weekend, and he could be almost any kind of prospect while making his second run since the summer. Jockey John Velazquez coming to ride is a huge positive, as well. This steady late-runner gets a tough draw widest of all and will also have to answer the nine-furlong question for the initial time. The talented colt is consistent but he must vault forward to have a say in the outcome here.